I just finished reading America, Welcome to the Poorhouse: What You Must Do to Protect Your Financial Future and the Reform We Need . And I have to tell you, I’m a little freaked out. All you have to do is read the Introduction to get freaked out. Well, it’s about a lot of things, but the heart of the book covers our four biggest financial stresses: empty nest eggs, unaffordable homes, overpriced colleges, and credit card debt. Yeah, it’s a lot to chew on. And I know it sounds as if the kind of book you wouldn’t want to read. After all, these can be grim topics. And who needs more grim these days? 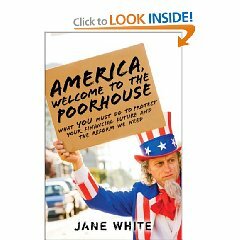 But America, Welcome to the Poorhouse succeeds because the author, Jane White, doesn’t just moan and groan about how bad things are. She opens ours eyes to the problems we’re facing fiscally, and then offers some great solutions on what we can do to protect ourselves. Every major financial stressor has its own section. And at the end of each of these sections, the author offers us a chapter called “The Fix”, which is full of clear strategies on what we can do to overcome the problem, and the reform we need in government to make sure these problems don’t keep cropping up. So, we’re not left hopeless at all the bad news-we’ve got tools and strategies to move forward. There were a number of incredibly shocking sections in this book. And I wish I could cover everything, because I was really impressed with how the author handled each topic, and the with the amount of new information I learned. But, I’ll stick with a few that really struck home. Many of you already know that our country’s retirement policy is a bit, well, broken. But, did you know that the United States has the second-lowest contribution rate in the world? The contribution rate is how much money your company is required to “match” when you contribute to your 401(k) account. Many companies get away with no matching at all. The ones who do match only have to pay 50 cents for every dollar you put in, or 3% of your pay. Again, this matching policy is the second lowest in the world. Even Mexico has a better contribution rate, at 6%. Australians get 9%. The author makes the point that because of this, and several other factors, over 80% of Baby Boomers won’t be able to retire when their time comes. And starting in 2011, more Boomers will be staying “on the job” simply because they can’t afford to leave. Want to know what else will happen starting in 2011? The first wave of Gen Y kids, one of the largest generations in history, will be graduating from college. They’ll be entering the workforce to look for jobs that aren’t being vacated by the Boomers. And, they’ll have student loans that need paying back. It will be an employment nightmare. This is an issue that I’ve truly never thought about. But it doesn’t take a rocket scientist to see how very bad this could be, both for Boomers and for Gen Y kids. The section on our credit card debt starts off with a good note. Obama and Congress has done the right thing: in May of 2009 a law was passed that bans interest rate hikes until a consumer is more than 60 days late, it requires that credit card “promotional rates” last for at least six months, and it requires that credit card companies disclose exactly how much it’s costing us when we pay only the minimum balance. But, we’re not out of the woods. The author points out that right now, 35 million Americans are only making the minimum payment on their debt each month. Which means they’re paying the maximum in interest payments. The author gives us a really illuminating graph in this section that shows just how much this is really costing us. For instance, if you put a $1,000 computer on your credit card and only make the minimum balance to pay it off, that computer (at 18% interest) is going to cost you $2,899. You could have bought three computers for that much. So, what’s the solution to overspending and watching our money? Well, the author gives us some great advice in this chapter. Don’t let your kids boss you around when it comes to money. Overpriced cereals, birthday parties, and toys aren’t necessary. And those $800 strollers that you’ll only use for a year or two? Not worth the money. Buy used! Reconsider allowances. Are you doling out cash to your kids every week? Do they do chores for that money? Make them work for it. They’ll feel more responsible about that money because they earned it, and you’ll get some cleaning done. Don’t buy brand new cars. Buying a used car over a new one can save you up to $15,000 or more. So, what’s my last word on “America, Welcome to the Poorhouse”? I thought it was great. The author did a very thorough job highlighting the four financial problems that most of us are facing and she gives us intelligent, useful strategies for overcoming them. And at the end of the book, she offers up an entire section that covers the kind of reform we need in our government to make sure these problems aren’t passed on to our children. While I think this book would be useful for anyone facing financial challenges in their life, I think it was the sections on retirement that had the most useful information and strategies. The author did a fantastic job talking about the reform we need, called the “401(k) Security Act”, and she did it in plain English. Considering that 80% of Americans really can’t afford to retire, this section might be worth its weight in gold. And, I really learned a lot about our country’s retirement policies, and how very sucky they are compared to the rest of the world. Sounds like a fascinating book. It’s too bad U.S. policies are debt-based. I think that’s the route of our financial problems. In Australia, 9% super contributions are compulsory, not matched. As long as you earn over $450 a month, your employer has to put 9% of what you earn (that is 9% extra, not 9% of your pay) into your retirement fund. We also have tax breaks for voluntary contributions: pre-tax contributions are taxed at 15%, rather than the 30% bracket that most Australians are in, and post-tax contributions are tax-deductible. To top it off, if you are a low income earner (under AU$58000 p.a.) the government will match a $1.50 for every $1 you contribute voluntarily. Very interesting. I’m adding this to my list of books that must be read. I’ve always felt that I would never be able to retire. My father had a pension fund, but my generation….definately no pension funds availalbe (& 401k is a joke, imo). I’m also concerned for my children. My son is suppose to go to college next year, but we are struggling trying to figure out how to pay for it. I really don’t want him burried in student loan debt when he is out of school. Not sure if the book offers any solutions, but it sounds like a really good read. Wonder if Australia would like some new citizens…………. @Deb- I hear you. Being self-employed, I don’t have any kind of 401(k). My retirement is all in a Roth, but I still don’t think it’s going to be enough. Could your son go to community college for the first two years? That’s what I did. I was able to pretty much put myself through school by working (and had a little help from my parents). I left school with no debt, which was such a huge relief. It was hard, because I had to work full time and go to school full time, but I lived. 🙂 Anyway, community college is much cheaper than university, and he could get his basics out of the way! @Queenstuss- thanks so much for writing in with that information! It’s amazing what a nice system you have over there. I wish we had that here. It’s Jane White, the author! Thanks so much for the great review! You are spot on that community college is a fantastic deal and as I point out in my book, many community colleges now offer four-year degrees as well. Thanks so much for writing in! I thought the book was fantastic, and think it’s going to help a lot of people. Thanks for the opportunity to review it! Sneezy – all the ailments like allergies; the many varieties of flu, allergic reactions to food additives and boosting the growth of animals with hormones that we kill for consumption. As I thought of this, I also thought about all the money that’s being made by the big pharmaceutical companies who treat these ailments and health problems that have resulted from these issues. Sleepy – most of us working folk are sleepy because we’re working over-time to hold our jobs; pay our bills, and keep up with the day-to-day obligations. Dopey – because our educational system stinks, and because too many people are taking legal and illegal substances. Doc – of course they’re making a bundle of money from our illnesses and additions. Happy – which is what we’re trying to be, so too often we’re using alcohol to excess – pills to excess – eating to excess, and the only real happy people are the rich people and big corporations. Grumpy – the 7th dwarf……………..
As for the name ‘Snow White’, I think most of us can put our imagination to that name, and come up with more than just one ‘applicable meaning’, don’t you??? ?